The following is a draft I wrote prior to the announcement of the iPad, but which I didn’t publish because it was a series of hypotheses based on an as yet non-existing product. It’s a series of thoughts on how an interface of a touchscreen larger than an iPhone might look like. It is inspired by both my experiences with Macs and since recently with an iPod Touch. Here goes. b. The Keyboard: I think that any 10″ screen will demand more connectivity to secondary (Apple) devices than the iPhone allows for. That means, an external keyboard and mouse, which transforms the tablet into a desktop. I have less complaints about the software-keyboard now, after working with a Touch for a while, but I still don’t see it as an alternative for longer texts, which a larger screen would warrant. Some months ago, I made a stupid mock-up of the iPhone + a keyboard (see pic), which is how I envision it looking (only better). Apple Dashboard in iPad-1.jpge. Integration with the Mac: One of the most underused interfaces, at least on my Mac, is Dashboard, which allows people to have continuously open widgets on anything from news, to games, to radio, to system monitoring. It’s useful for those purposes, but not really something i spend more than a few minutes at a time with. 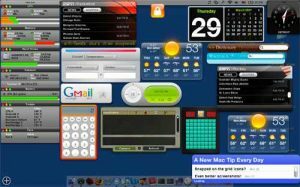 Yet the first thing that came to mind when thinking of a “Tablet,” using both iPhone and Mac interface components, was Dashboard. It creates a new layer on top of a traditional desktop, allowing for user-input and information display. When I envision someone running the apps that would work on the “iTablet” also, I think of it either being that you open up a new layer on your Mac and run the very same apps on it through something like a Dashboard-like interface. Or, and the simplest solution is usually the best, through having the Tablet sync through iTunes with regular applications on the Mac. Note from today: well, obviously this was wrong, but there have been several theories aired of having a type of Dashboard on the iPad for apps like calculator and weather, which don’t at all make sense to run in single focus on a larger screen than the iPhone. Further thoughts from today: I do think that we will see a new OS update for both the iPhone and iPad before the release of the iPad. This will address the concerns that people have about it just being a larger iPod Touch. For the rest, to me the only downside to this device is the lack of a front-facing camera for video-calling, and some minor things. And I also think it’s the perfect “parent device!” What the Wii was to gaming, the iPad is to computing, addressing a very very blue ocean. As previously stated, I’m still in line to get one this year, though only after trying one first.